I live at the edge of the continent, where an elbow of the world’s largest ocean juts into the far western side of North America, where ocean is trying to become land and land ocean. 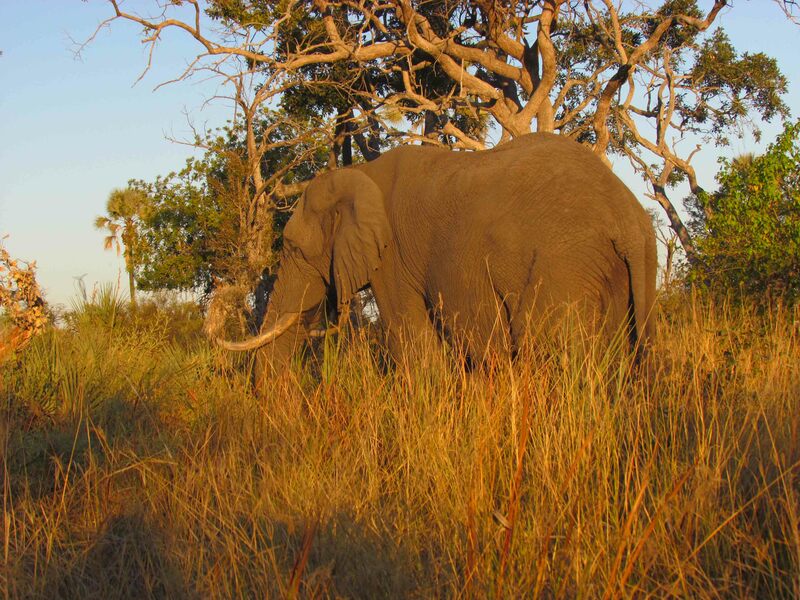 I live where elephants once roamed, where mastodons and mammoths ranged the southern edge of ice sheets. They lived, literally, in my back yard. Thirty years ago mammoth bones and teeth eroded from the cliff just a half mile from my house. Last night I had a dream, born, I guess, from the days when I lived in Seattle. As if my clock radio had gone off, I heard the voice of a male announcer in my ear. Traffic Alert! The 520 bridge is slow, slow, slow this morning. 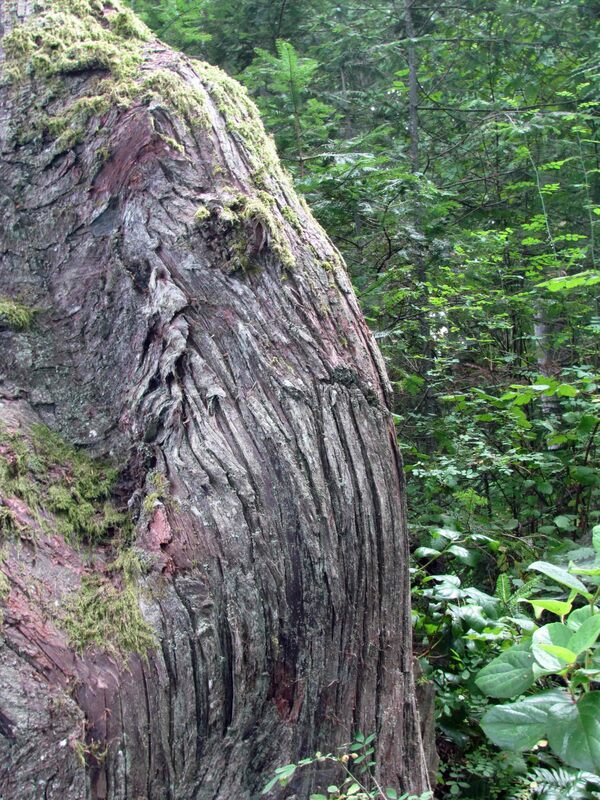 Mammoths are beginning their annual migration from the Cascade Corridor into the Arboretum for salal berries! Let’s take a look at the traffic cams. Yep, cars are really creeping, trying to get a look, as the mammoths cross the Wildlife Bridge at Montlake. And now we’ve got reports of a couple of herds at the beach near the old Pier 51 site. Female voice: Wow, Clark, look . . .at. . .that! Ferry commuters are gonna get a great view from Coleman Dock. Isn’t that something! Male voice: Well, that’s the latest traffic update. Expect major delays into downtown this morning. Now, back to our top story . . .
It’s dark, 4 a.m., and I awaken laughing and crying, wondering where dreams come from. Wondering if I’ve imagined an alternative present where mammoths and mastodons still migrate through our daily routines, safe from the closed door of extinction. 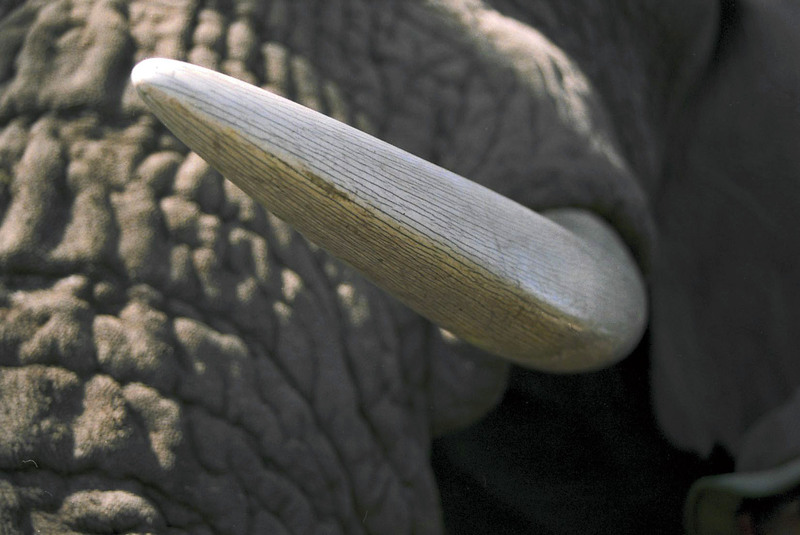 Wondering what I would see if I rose in my dream and looked out my window: mammoths in the grass, in the moonlight, plucking the heads of dandelions one by one, mastodons stripping the bark of the cedar tree in my neighbor’s back yard. 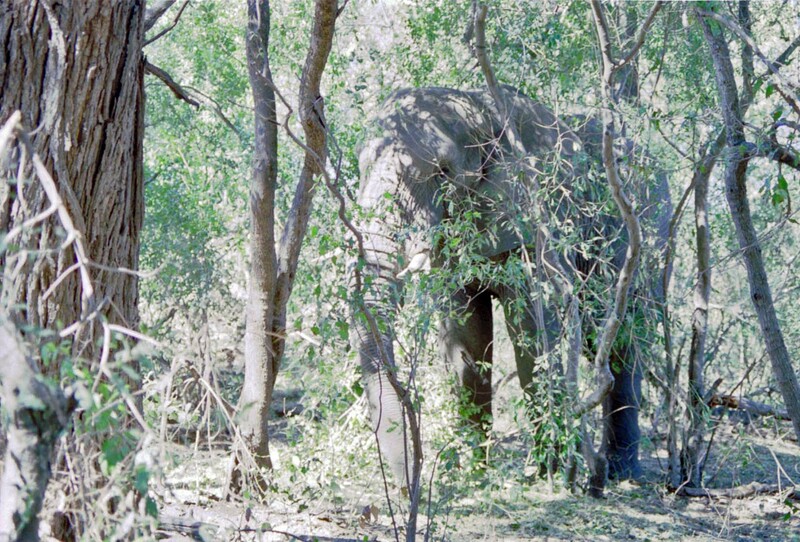 Elephant ghosts reclaiming their land. As Doug and Sandi prepare for our morning walk, a nearby Cape mourning dove begins its chanting call: hoo-HOO-hoo, hoo-HOO-hoo. The dove is the same shape and color of the pigeons strutting the streets of my hometown, and belongs to the same family as pigeons, Columbidae. Doves are generally smaller birds and pigeons are larger. One member of Columbidae, the American Passenger Pigeon, was once the most abundant land bird in the world. It’s been estimated that nine billion passenger pigeons were in the United States before colonization – more than twice the number of all birds alive in the U.S. today. Up to a foot-and-a-half in length, the passenger pigeon had distinctive, even iridescent, coloration. In the early 1800s a flock of passenger pigeons that numbered 2.2 billion birds flew between Kentucky and Indiana – a flock one mile wide extending 240 miles. So many Passenger Pigeons were in that flock that if they were placed beak-to-tail they would have wound around the circumference of the earth nearly 23 times. Audubon recorded an over-flight of Passenger Pigeons that took three days to pass, even though the birds averaged sixty miles an hour. He likened their passage to an eclipse of the sun. One nesting colony in Wisconsin measured 850 square miles. The rumble of wings erupting from that roost made the ground tremble. Tune your stereo receiver to a place between stations, then turn up the volume until your walls shake. That was the sound of huge flocks of passenger pigeons, a Niagara of birds. 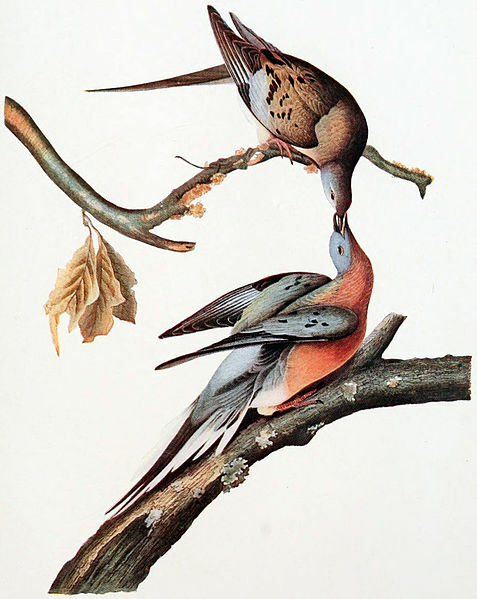 Audubon painted the passenger pigeon in 1824. Printed plates of his painting show a female on the frosted upper branch of a tree feeding a male perched on a lower branch of the same tree – which is a bit of artistic license, since the pairs always stood next to each other on a branch. The sexes of the passenger pigeon differed in coloration. The female, with her drab, brownish-orange back and gray plumage on her belly, contrasted with the male’s brilliant blue back and deep pink breast. In Audubon’s painting the male has a duller neck than was often reported – a neck that glittered purple, gold, yellow and green iridescence. Both sexes are depicted with their trademark pink feet and red eyes. Now the passenger pigeon is gone. Snuffed out. Not a single bird left. Flocks in the millions whose wing beats sounded like thunder, whose descent to the ground in funnels looked like tornados, whose excrement rained to the ground like sleet, gone. Flocks that blocked sunlight from the sky and moved in squalls, in weather fronts, gone. Flocks that would have turned entire radar screens green, gone. Their extinction was not a natural one, caused by a meteor or ice age or disease. No, we did it. We destroyed their habitat, hunted them, killed them, ate them, fed them to livestock, stuck their feathers in our hats, and shipped them by the ton in railroad cars, five billion birds by the late 1890s. No one ever thought that five billion birds could disappear. An Ohio legislator wrote in 1857 that the pigeons were “Wonderfully prolific. No ordinary destruction can lessen them or be missed from the myriads that are yearly produced.” But nets, guns and the railroads did their job. Speedy travel meant that pigeon feathers and meat reached their markets in forty-eight hours. Live pigeons were shipped for sport. An estimated half-million pigeons were netted annually for use in shooting matches. One trap shooter claimed he had personally shot 30,000 pigeons in his lifetime. In 1875 three nesting areas in Michigan yielded 1,000 tons of squabs and 2.4 million live birds for consumption. And yet, scarcely 25 years later, a young boy in Ohio named Press Clay Southworth shot the last wild passenger pigeon on March 12, 1900. 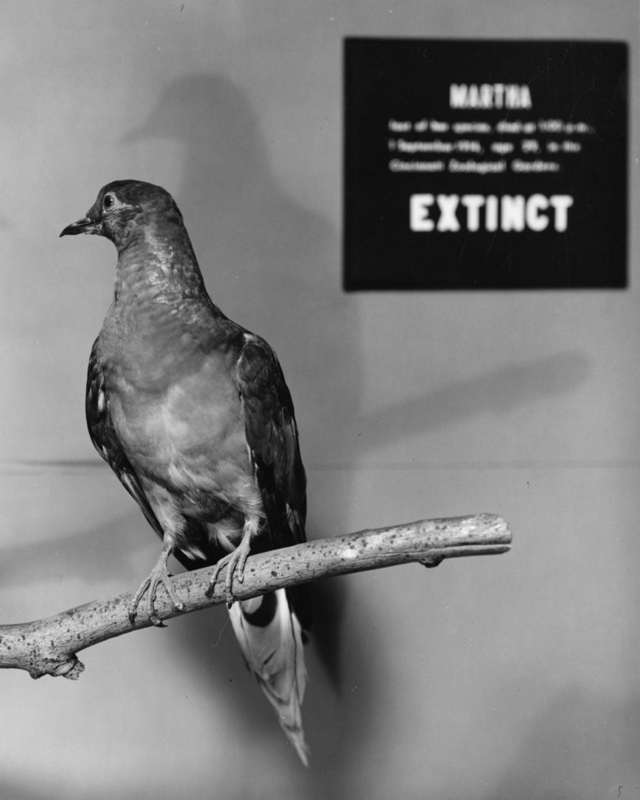 On Sept 1, 1914, Martha, the only passenger pigeon left in the world, died at the Cincinnati Zoo. I wonder what our skies would look like if the passenger pigeon (instead of the turkey) had been designated our national bird. Life. It’s not easy to come by. And lessened by all that has been subtracted from it.